Toni Stopka grows up in the shadow of Palisades Park. Her parents own a french fry stand, Toni learns to swim in the park pool, and their friends work at the boardwalk stands and rides. As they live through the turbulence of the mid 1900s, each member of the Stopka family dreams of finding success. Father Eddie thinks of opening a restaurant, mother Adele dreams of the thrill of applause, Toni wants to become a high diver, and her brother Jack pursues becoming an artist. Ambition and conflict drive the family apart, but can their beloved Palisades Park bring them back together? 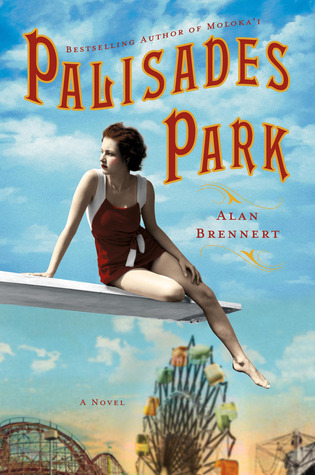 Alan Brennert cuts through a wide swath of history with his novel Palisades Park. It opens with Eddie as a child in the early 1900s and follows the Stopka family for the next 70 years. The Great Depression threatens to cripple the Stopkas and the park and Eddie and Jack feel the call to serve their country during WWII and the Korean War, respectively. Adele and Toni face a rapidly changing world for women as the wars redefine their roles in the family and the workplace. While Toni is the main character of this novel, the focus is really Palisades Park itself. It almost becomes a character as we see it grow and change through the years. We learn about so many of the people who gave it life - the performers, the people who ran the food and game booths, and the owners. It becomes a home for the characters, just as it did for many people in real life. At times, though, it feels like the characters and their stories are serving the history that Brennert want to cover instead of the other way around. The author decides to utilize the civil rights movement as a plot point and, while it is certainly an important part of US history, it feels jarring to suddenly discover that members of the Stopka family have such passion for the cause when it has never been mentioned before. I would have rather spent some more time with Jack and Adele, the two members of the family who get the smallest number of pages. I would especially have liked to see some of Adele's journey as she strikes out on her own hoping to find success in show business after many years of being a committed wife and mother. Palisades Park is both a sweeping epic of American history and a microscopic look at one family and the park where so many people made memories. The Stopka family begins to feel like your family - you can't help but cheer as they go off on their own to achieve their dreams, but it doesn't feel quite right until they are all back together. This is a perfect book to read during a cold winter so you can dream about a perfect summer at the boardwalk. Warmer weather does sound nice...even if it's only in a book. Fun review. Thanks! I know! It's nice to imagine yourself at the boardwalk when there is freezing rain outside your home. Or snow! It's only December and I'm already dreaming of summer. I know! A few too many days at the bus stop when it's freezing or sleeting and I'm just about done. I think I would looooove this. I'm kind of a sucker for books set in places that function as a main character. So cool! I think it's such a great concept. There are definitely places in our life that have that sort of value and I really enjoy when an author gets it right.